A countertop dishwasher, also referred to as a compact or portable dishwasher, is small dishwasher that sits on top of a counter or any other flat surface. It has a lot of the same capabilities as a full size dishwasher but is much more compact, portable, and uses less energy. Generally, these dishwashers use a quick connect adapter that connect to a standard sink faucet for water intake. They have a drain hose in the back of the unit that allows for drainage to run directly into a sink. Everyday we get asked questions about our portable and countertop dishwashers. Below we have listed out the most frequently asked questions we receive. Please feel free to give us a call at 1-800-297-6076 if you have any other questions, or would like more details on one listed below. 1. Why should I get a countertop dishwasher? 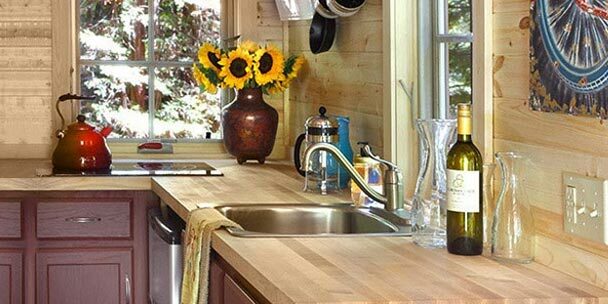 Countertop dishwashers are extremely versatile units. Whether you need one as your primary dishwasher or for supplemental use, these units can adapt to your needs. If you live in a small house lacking the space for a built-in unit, or are renting an apartment without a dishwasher, a portable dishwasher can be life saver. 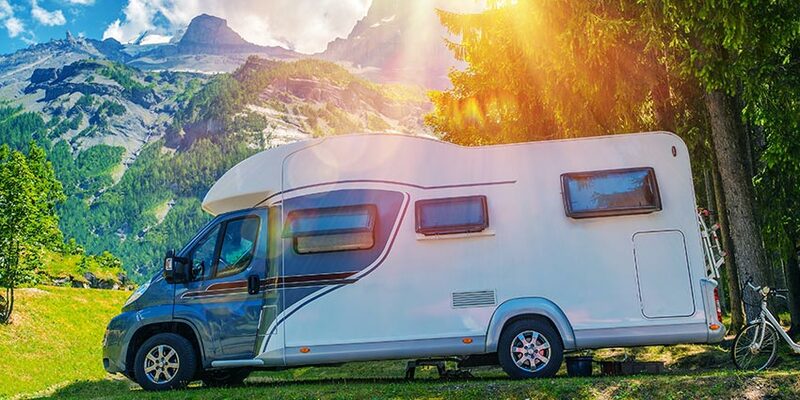 From office coffee mugs to baby bottles, RV road trips to college students, people are discovering that countertop dishwashers are super helpful in a variety of applications. 2. Does a countertop dishwasher produce different results than a normal dishwasher? Countertop dishwashers clean just as efficiently as full-size models. Although, as you might expect, portable dishwashers use considerably less water and detergent than their full-sized rivals. This doesn’t mean they don’t clean as thoroughly, they just don’t need as many resources to achieve the same level of cleanliness. 3. Can I install my countertop dishwasher permanently? Yes, some countertop models can indeed be installed permanently. However, no models are specifically designed for permanent installation so it’s not recommended to do so. Improper use and installation could void the warranty. We recommend you keep the unit portable and follow all instructions. 4. Can I put this unit under my sink, draining to my garbage disposal? Yes, some models of countertop dishwashers can indeed be installed to your main water line. However, there are no portable units specifically designed for this type of permanent installation, so it’s not advised to do so. Please check with the manufacturer of the countertop dishwasher prior to attempting this to ensure that it is safe to do. 5. I don’t have a lot of counter space, how much room does it take up? Another advantage of countertop dishwashers is the compact size. They usually take up no more room than microwaves and sit on top of any flat surface. Most models can even fit directly underneath the cabinets making it perfect for small spaces. The inconspicuous size means when the dishwasher is not in use, it can be tucked away in a cabinet or rolled away on a kitchen cart. 6. How will a countertop dishwasher affect my utility bills? Countertop dishwashers are extremely economical and efficient, they use substantially less water than manually washing dishes or a traditional full-sized dishwasher. Each wash cycle, which holds 4-6 place settings, uses about 3 gallons of water. 7. Are there specific wash cycles? Many countertop dishwashers offer the same features as a full size dishwasher including different wash cycles. They usually include heavy, normal, light, glass, speed and soak options. Portable dishwashers may also offer automatic detergent and rinse aid dispenser. To help you find the best countertop dishwasher for your unique situation or lifestyle, it is recommended that you learn a few key terms that you will likely come across during your search. An easy and convent way to connect the hoses to a sink, it should fit most standard faucets. The basket inside the dishwasher designed to hold forks, knives, spoons and other cutlery. When loading your silverware, be sure that none of the prongs are poking through so the spray arm can move freely and clean properly. The interior of the dishwasher set up to hold anywhere from 4-6 place settings. Check out the owner’s manual for ways to load the dishes that will optimize the compact space. A container that dispenses rinse aid, which can help dry your dishes and eliminate water spots. If you notice your dishes are coming out with unwashed residue or a cloudy appearance, then you may want to consider using a rinse aid. 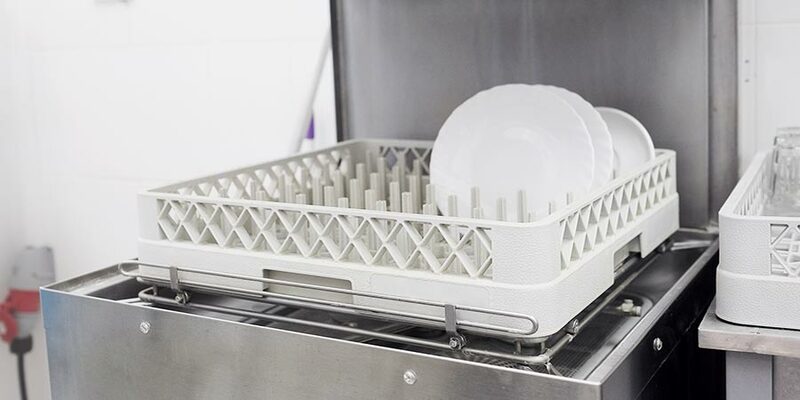 Make a careful note of the exact dimensions you can use to accommodate a countertop dishwasher. Take special note of the distance between the top of your counter and the bottom of your cabinet. You definitely want to consider how much you can put into your dishwasher. Most countertop dishwasher models will accept up to 6 place settings, but it may vary from model to model. Countertop dishwashers with stainless steel interiors will be more durable and should last longer than models with plastic interiors. If it is important to you to have a dry cycle, look for a model that includes this feature. If the water draining out of the countertop dishwasher needs to go above the level of the countertop dishwasher (as it would if you placed the unit below the level of the drain) you need a model with a pump. You can avoid this problem by knowing beforehand where your portable unit will be placed. 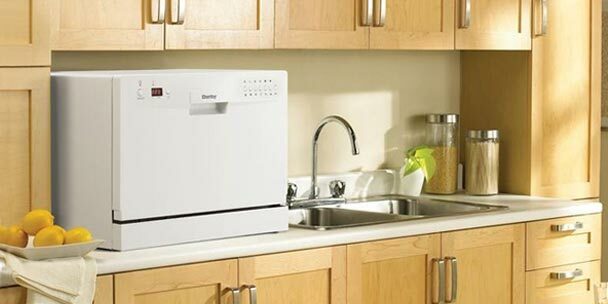 Most countertop dishwashers come with water heaters of varying power. Those dishwashers that have water heaters also usually have two or more settings to vary the power of the heater. 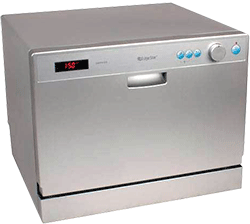 Different portable dishwasher models vary in their number of cycles. So, think about what is important for you and your family, and buy accordingly. Check the water and energy usage of the countertop dishwashers to find one that meets your needs. If you have any further questions, please feel free to give us a call at 1.800.297.6076 or leave us a comment down below. Using a countertop dishwasher couldn’t be simpler! Most units come with everything you need to quickly set it up. First you’ll need to find a level surface to place the countertop dishwasher on. There are two hoses, an inlet and drain hose. On the back of the dishwasher there are two ports for each hose to be screwed in. Place the quick connect adapter to your sink faucet and connect both hoses to it. Plug the unit into an electrical outlet and begin your wash cycle. When the wash cycle is finished, you can unplug all of hoses and put it away until next time. There are no tools required, making it an easy and convenient appliance to set up and operate. To maintain your countertop dishwasher be sure not to overload the dishwasher and that no dishes or cutlery is obstructing the spray arm. Rinse off any excess food or residue before starting a wash cycle. 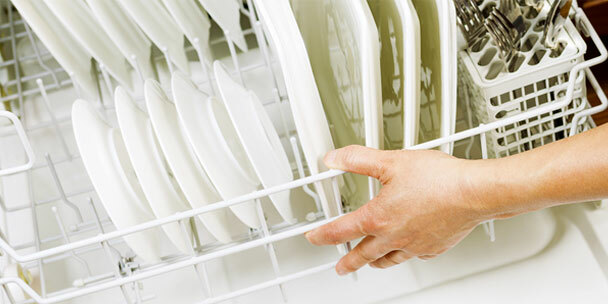 With proper care, your countertop dishwasher can save you from years of time consuming hand washing. 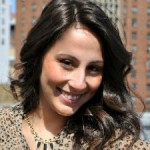 Lyndsy is a new mom who recently moved from New York City to Austin, TX with her husband and dog. She loves to watch The Food Network, discover new restaurants around town, and can’t pass up the opportunity to pet a cute puppy. Very well researched article about diswhashers, espectially for small apartments! I believe every question was answered before it was asked. How does it do with pots and pans? Wish there was a picture w/ the pots and pans in it. What countertop models have pumps? I need it to be in a cabinet below but the cabinet is not wide enough for a “DishDrawer Dishwasher” which does have a pump but is 24″ wide. You mentioned (above) that some countertop (compact) dishwashers do have pumps, right? I have 11″ diameter dinner plates. Will they fit? How can I find out which models will hold these? Can you tell us which models have a pump? We want to mount it under the counter so we will need one. So far all that I have looked at don’t specify a pump? Yes, countertop dishwasher suitable for small apartments or small kitchen since it does not require much place, easy to use and maintenance is not difficult. You can fit like one good size pot or pan in but they clean very well. How long is the wash cycle? 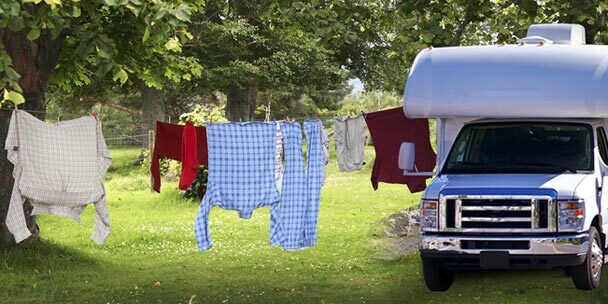 Why do commercials machines have wash cycles that are only a minute or so verses home models that take an hour? My faucet is a mixer (hot and cold water come out of one single outlet) Will any table top dishwashers be suitable for this type of faucet? I bought a table top dishwasher but I want to know if the drain host must be higher than the dishwasher or at the same level or can we put the host running down into a bucket or bottle. I dont want air bubbles to form. If the two hoses that go to the sink adapter are kinked up (not enough room to have them straight) will that cause the dish washer from Workin properly? Thanks for this article! My boyfriend and I live in Austin too, and found a rental property we like that has no dishwasher. This answered a lot of questions I had and it’s so nice to be able to seriously consider the property again.